Alison Bondurant practices in a broad range of areas involving commercial and personal advices, including wills, trusts, and estate planning, corporate counseling, and commercial transactions, and as well as commercial and succession litigation. Her principal focus is in wills, trusts, and estate planning. Prior to joining the firm, Ms. Bondurant practiced at a regional defense firm. Ms. Bondurant received her Juris Doctor and Bachelor’s in Civil Law from the Paul M. Hebert Law Center at Louisiana State University in 2005, where she was admitted to the Order of the Coif. She also served as Articles Editor for the Louisiana Law Review for Volume 66. She received her undergraduate degrees in English and Anthropology from Louisiana State University. She is admitted to practice before all state and federal courts in Louisiana. 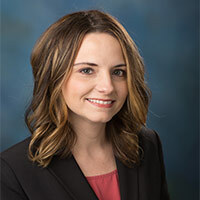 She is a member of the Louisiana State Bar Association, the 22nd Judicial District Bar Association, and the Northshore Estate Planning Council.